The AKP-MHP fascist rule, in collaboration with the anti-human gangs has launched an occupation attack against Afrin. They want to totally strip Afrin, an oasis of democracy for Syria and the Middle East, of the Kurdish population and replace them with these gangs. The AKP-MHP fascist rule has once again demonstrated its enmity towards the Kurds. Through this occupation attack, they want to shore up and nurture the reactionary forces in the Middle East. Knowing that a ground operation is doomed to fail, they began the occupation by using the Syrian air space, opened to them only after a dirty deals. They have attacked the city using approximately 100 fighter jets, an unprecedented case in the history of warfare. This occupation has faced the historical resistance of the people of Afrin and its self-sacrificing freedom fighters. The Afrin occupation attack has not only revealed the true anti-human nature of the Turkish state in the person of AKP-MHP fascist rule, but also has, at the same time, proved how a people empowered by democratic community principles can strongly resist. 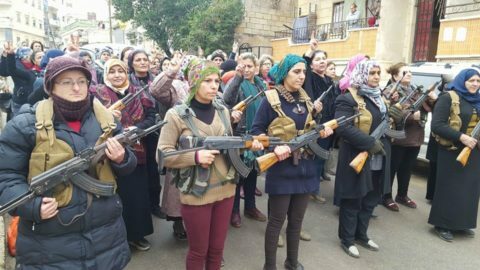 The people of Afrin and their self-sacrificing girls and boys, inspired by freedom and democracy ideals, have given the “no parasan” response to the occupation forces. They have rebuffed all the attacks during the last 6 days. We salute the people of Afrin and their self-sacrificing fighters who defend their homeland and democratic values. We congratulate them in advance for the victory they will gain in the most rightful battle of history. The Afrin resistance is the resistance of all Syrians, the peoples of the Middle East, and all humanity. There is no difference between ISIS and AKP-MHP fascism and its collaborating gangs attacking Afrin. ISIS’s attack on Kobani and AKP-MHP’s attack on Afrin share the same goal. Recognizing this fact, all the peoples of the world and democratic circles have united around the historic resistance of Afrin. The attitudes of different states regarding this occupation may be driven by interests and have thus heartened it; However, regardless of these attitudes, the peoples all over the world have supported the Afrin resistance. We salute the democratic humanity and all the peoples for their support. Humanity’s conscience and sense of freedom and democracy united around the Afrin resistance have once again showed that humanity will not let fascism triumph. Afrin is a manifestation of the accumulation of humanity’s sense of freedom and democracy. Leftists, socialists, environmentalists, feminists, pro-labor circles and peace activists should organize their stance more effectively so that the sense of solidarity and the power of struggle needed for victory will emerge. Once AKP-MHP fascism is defeated, the wave of freedom and democracy, starting from the Middle East, will spread all over the world. The Afrin resistance provides the peoples of Turkey with a historical opportunity for achieving peace and democracy. Once this anti-democratic and anti-freedom fascist rule, joined by CHP, is defeated, the hurdles in the way of freedom and democracy will be removed and the peoples of Turkey will achieve fraternity, democracy, and freedom. We salute all the democratic forces who have opposed the AKP-MHP fascist attacks and resisted the anti-democratic and anti-freedom attitudes of CHP. We believe that tomorrow’s Turkey will be found on the basis of your honorable and courageous stance. We reiterate our commitment for staying in solidarity with your hard struggle. The Afrin occupation has once again had the Kurds see the anti-Kurdish nature of the Turkish state, as the vanguard of enmity against the Kurds. It has been revealed that unless this fascism is defeated, no part of Kurdistan will achieve freedom and democracy. Afrin resistance instantiates the unity, common stance and struggle of the Kurds in all parts of Kurdistan and the diaspora. We congratulate our people in Kurdistan and in Europe for their stance. We would like to reiterate our commitment to a Free Kurdistan and democratic Middle East, goals to be achieved through the unity of the Kurds, their unity with other peoples, and their common struggle. We call on the Kurdish people and all the peoples of the Middle East and all over the world to unite and stand in solidarity with the Afrin resistance. The Afrin resistance will prevail, AKP-MHP fascism will be defeated, all Syrians and the peoples of the Middle East will achieve their freedom and democratic rights.